Founded in 1999 by artist Walid Raad, The Atlas Group documents a fictional archive consisting of lectures, documentaries, and installations about Lebanon’s civil war. Through it, Raad has created an alternative world, one in which conflict is not portrayed as a succession of facts, but as an abstract composition of memories and media reports. My Neck Is Thinner Than a Hair is the second volume in a series of artist’s books disguised as archival publications by The Atlas Group. 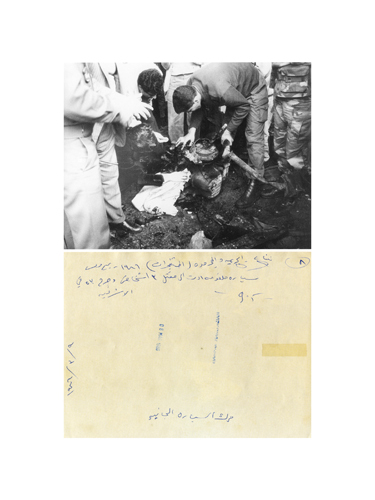 The book documents work that was in the AGYU’s 2004 exhibition of The Atlas Group and Walid Raad and is comprised of images produced by photojournalists depicting the use of car bombs in the 1975–1991 Lebanese wars. Designed by Anne Sappenfield and Mind the Gap – Beirut.